Windows - Open Windows Explorer, right-mouse click on the file and select Properties > Details. macOS - Open the folder in the Finder. Click 'Get info' or Right-Click the file and choose 'Get info'. Title - In this field you can write the title of your song. Genre - Genre of your song. 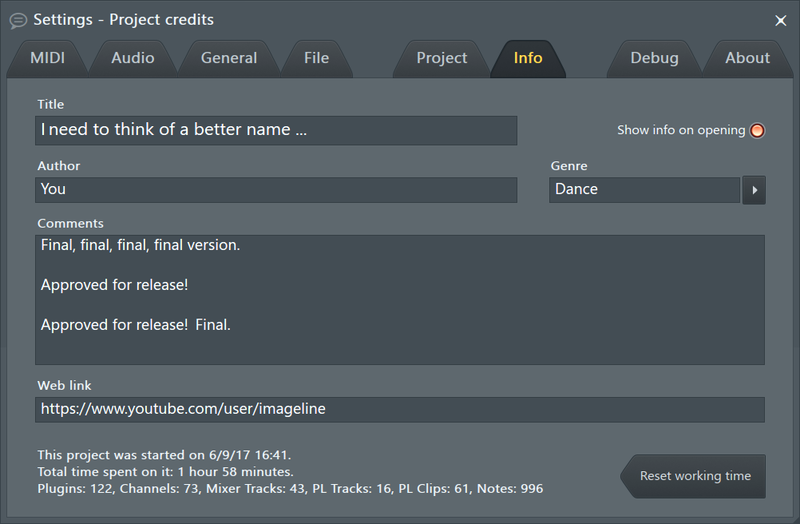 This parameter is compatible with genres in .mp3 and .wav files and is saved when you export your project to an audio file. Author - Enter the name of the project author (composer) here. This information is saved in .mp3 and .wav files on export. Info - Enter additional information about the song here. URL - Enter the URL of your homepage or your e-mail address here. Show it on Open - If activated, a small window displaying the title, info and clickable URL will appear when a project is opened. Reset working time - Time is money! The log to the left of the button shows (approximately) how long you have been working on the project by tracking activity. Tip: Glue a wireless mouse to your dog and earn more money!